Be the first to share your favorite memory, photo or story of Elinor. This memorial page is dedicated for family, friends and future generations to celebrate the life of their loved one. 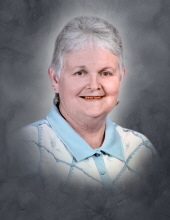 Elinor “Nadine” Pickens was born July 18, 1938 in Dew, Texas and passed away March 17, 2019 in Tyler, Texas. She was born to Riley Wallace & Tommie Herndon (White) Martin. She grew up in Dew. Nadine married the love of her life and lived the first of her married years in Teague and Dew. They built a home “in the country” near Oakwood and she remained there for her last fifty-plus years. Nadine had worked as a medical aide for MHMR in Mexia and was a faithful member of First Baptist Church in Buffalo. She enjoyed working in her yard and flower beds and watching the wildlife outside. She loved her Lord Jesus and listening to Christian music. Most importantly, Nadine loved being with her family. Nadine was preceded in death by both of her parents; husband, Spurgeon Calvin Pickens; sister, Donna Kay Bristow and brother, Jack Glenn Martin. Surviving family incudes son, Kerry Calvin Pickens (Janet) of Oakwood; daughters, Kelly Nadine Bing (Brent) of Oakwood and Becky Epley (Jeff) of New Braunfels; brother, James Wallace “Bud” Martin (Kay) of Big Sandy and sister, Nancy Vire of Grand Prairie. Nadine is also survived by grandchildren, Sabrena, Robert, Deuce, James, Amanda, Trey, Matthew, Calvin, Nathanael, David, Joseph, Tommy, Nadine, Lisa Kelly and a foster grandson; thirteen great grandchildren and numerous cousins, nieces, nephews and extended family. A celebration of Jesus will be held 1 P.M., Saturday, March 23, 2019 at First Baptist Church in Buffalo. Rev. Alan Grisham will officiate the service, and interment will follow in the Spurgeon C. Pickens Cemetery in Oakwood. A visitation will take place Friday, March 22, 2019 from 6 P.M. to 8 P.M. at the Walters’ Buffalo Funeral Home in Buffalo, Texas. Some of the most important lessons in life Nadine wanted others to know are: Try always to find the good in people and not the bad. It may be a challenge! Enjoy what you have and who you are. The pleasure of what we enjoy is lost by wanting more. A healthy part of growing up is falling down. Above all, seek Jesus. He is always there. In lieu of flowers, memorial donations may be made to the Light of Hope Center, c/o Ron McCarty, 1906 Sigman Street, Hickory, NC 28602 or LightofHopeCenter.com. To send flowers or a remembrance gift to the family of Elinor "Nadine" Pickens, please visit our Tribute Store. "Email Address" would like to share the life celebration of Elinor "Nadine" Pickens. Click on the "link" to go to share a favorite memory or leave a condolence message for the family.